Helen Sword’s 2009 web sonnet, “Arachne” is an homage to the mythological encounter of Athena and Arachne. 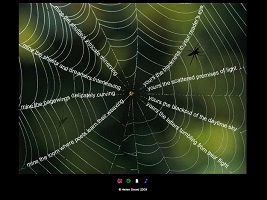 The contrasting stances of human and mortal are set against visuals of green leaves and spiders, with language forming the webbed pattern between them. The poem advances as the reader clicks on the spiders, the heart of the web, or hovers the cursor over their forms, thereby navigating between either Arachne or Athena’s points of view. For those who might have trouble traversing the poem itself, there are links at the bottom of the page that allow for a full text view of the work as well as an audio version. This is part 3 of a series of 5 postings on poems generated by the “Frequency” program. 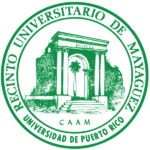 For an overview of the series, visit the first entry. The terza rima and sonnets generated by the “Frequency” program have two main challenges: coherence over a greater number of lines and the rhetorical expectations that come with the form. The easiest part of all this is rhyme, since Rettberg created 12 arrays according to line endings and up to 7 rhyming variables that draw from them to create poems with the necessary rhyme schemes..